One of the areas of the industry that I wanted to shine a spotlight on when I came over to DAD was on the labels striving to provide killer music to the world and how they function. As an individual who&apos;s been working at record labels for over a decade, I feel like I know as well as anybody how much fire it takes to maintain something you love so much and want to see succeed as well as the realization of how things become a true labor of love. And let&apos;s be real: very few labels in today&apos;s EDM scene (and the music industry overall) are making substantial loot. To make the jump into starting an independent record label where things are at right now is incredibly difficult. We wanted to highlight some of the imprints that are out here exceeding expectations, and the label I&apos;m kicking this series off with is Main Course. The concept itself is a little over a year old, but things have been dropping frequently and with quality consistency that is beyond impressive. I caught up with the three-headed monster pulling the strings on MC recently and the motivation and enthusiasm from this camp is very easy to quickly recognize. You guys as a collective have been steadily making noise in 2013 after relatively coming out of nowhere. 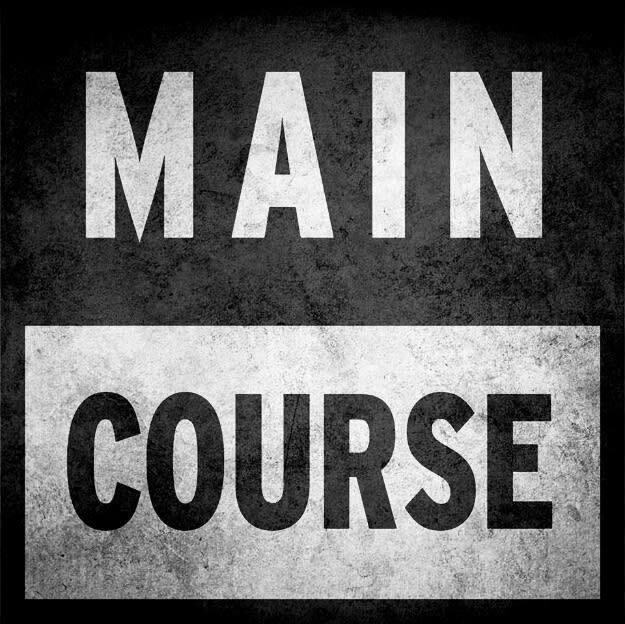 How and when did everything formally come together for Main Course to become an actual thing? Who&apos;s all involved in the business and who&apos;s on the roster (if there is one)? Astronomar: Yeah we&apos;ve been pretty busy! The idea of Main Course became public and was on its feet mid-May of this year, while Neo(teric) & Bot were visiting in LA and we released my EP & Bot&apos;s simultaneously. The core of Main Course is Neo, Bot, and myself, but our crew is large. We have fam all over the globe. Neoteric: Yeah, May 2013 was the real jump off for Main Course as its known now, but I started it in Berlin in 2012 with huge help from my friends Zia and Logan (who did the amazing logo). It hit its stride, then took a hiatus...but is back in full force. As (Astrono)Mar said, we&apos;re the core but our artists are the heroes, we are so glad to be working with so many amazingly talented people! Bot: Back in 2012 I was working on another project and Neo was involved too. I was into the Main Course idea he had started to work on already back then. After Mar joined us, too, but yeah I agree that what defines Main Course are all the people involved, the artists as well as the audience. As much as you guys are willing to divulge, what are everyone&apos;s responsibilities at Main Course and do you guys project any potential internal expansion with label staff, roster, etc. in the near future? Astronomar: Personally, I am primarily involved with the the A&R side of things... sorting through demos, reaching out to artists, searching for new talent & doing my best to right any wrongs that may present themselves. I also ship out all of our shirt orders (laughs). But we are getting to a point where an intern would be super helpful, and we just started to work with a student in London, Ontario. Neoteric: I&apos;d guess you&apos;d say I&apos;m the captain - the planner, the overseer, the dot connector. Bot and Mar are so on point with new club sounds, and I personally lean more towards the house and "other" spectrum these days, so we achieve a nice balance. Speaking of interns, we just got one, so watch for us to be at least.... 40 times more powerful very soon! Bot: Captain Neoteric is overwhelmed with tasks these days and every bit of help we can get is welcome. Although it is difficult to find the right people to work with, we saw a surprisingly good attitude towards Main Course. For the first time I&apos;m working with such positive and nice people, and as stupid as it might sound, it feels really great! I hope we can convey that to future collaborators. The majority of your releases come out for free via your website and social media outlets. Was that the mindset from the beginning? What&apos;s your reasoning for giving away so much for free in addition to selling the releases on the back end through more traditional digital retail outlets? Is this allowing you to provide any substantial revenue for the artists releasing music on MC? Astronomar: At the end of the day what&apos;s important to us is the music. We know and understand that if people want music, they will find a way to get it for free. We cut out the third party site, give the music to you for free, without pop-ups,; and if you love it you can support it with a purchase. It&apos;s obviously not a "get rich quick" scenario, but we work with artists we believe in and are proud to give them a platform. In your short time of cranking out an insane amount of quality music, what do you guys ultimately dedicate your success to...so far? Astronomar: I&apos;d say our discretion might be our strongest asset as a label. We only mess with tracks we really believe in. Genre isn&apos;t important. We aren&apos;t going to release something because a certain genre is hot at the moment. If we like it, we like it. Neoteric: I&apos;d agree. Our ears are amazing. We really do listen to everything and try to react quick - and when we do so, we&apos;re able to pounce on hot new records before the other guys. Bot: Also, sometimes we find artists that we know could deliver something good and interesting even if they don&apos;t have anything that is perfect at the moment. In those cases, we always encourage them to keep sending tracks and after a while we usually end up finding the right one. How do you guys feel about the idea of a label "brand" still being an important aspect in today&apos;s free-for-all mindset in the music industry? Has this changed or evolved at all since Main Course started? How so? Astronomar: It&apos;s definitely important. People can get music anywhere these days. Literally. So many blogs, so many artist run sites (SoundCloud, Bandcamp, etc. ), I think the goal is to create an idea people can grow to trust, and expect a certain level of quality when they do the research. Neo: Super important. I&apos;m learning this more and more. We really have to thank Logan Sturrock for the iconic logo. People are really attaching to that and its made all our merch ideas hot on the streets and useful. We even have matches and stickers! You can get shirts, too. Plus we have hats and hoodies coming soon, too! Bot: For Main Course, the brand is essential to make people aware of what we are about. We are open to every kind of style. What we want to be 100% consistent about is the level of quality and originality. So that when someone stumbles upon our name and or logo (big ups to Logan) they know it&apos;s worth checking. Tell us a bit about what&apos;s in store for the coming months and in 2014. What are some long-term goals you guys see/have in the foreseeable future? Astronomar: In the long term, the music will stay thorough. We are also in the process of getting more merch as Neo mentioned. We&apos;re also working on organizing some showcases at the upcoming city wide music festivals. Lots in store! Neoteric: We hope...to eventually present stages with our artists on them, more merch as mentioned, way more songs and full releases. And just keep providing undeniably good music coming out weekly! Bot: Yeah, live shows will be an amazing way to promote the label, the artists involved and raise some funds to invest in future projects.